Taronga Zoo’s (Sydney, Australia) QBE Free-Flight Bird Show was established in 1997 and since then has presented over 10,000 shows. These shows aim to entertain and delight, whilst inspiring our patrons to act for conservation. To assist, six ‘Take Action’ themes were devised. To support this initiative, Australian native possums were considered as a new species that could be introduced. It challenged the borders of our current show; the borders of our existing knowledge (training and welfare) and in an international context may challenge the borders of the zoo keeping community’s understanding of our possums. This case study focuses on ‘Richie’, a hand-reared Common Ring-tailed Possum that was acquired in late 2011, chosen as an ambassador species for the ‘Take Action’ message of ‘Save and Create Habitat’. Unfortunately ‘Richie’ was not successfully introduced to shows, however did make substantial progress and green-lighted the acquisition of Common Brush-tailed Possums, our preferred choice. He has since been transferred to our Education department. As such, the main elements of this paper focus on the successive approximations and operant conditioning strategies used (primarily positive reinforcement), the welfare implications considered, the need for choice and predictability, and the overall outcome of the venture. America’s Teaching Zoo at Moorpark College has housed a troop of brown tufted capuchins (Cebus apella) since 2000. In 2012, it was decided to catch all seven capuchins to allow medical work-ups and to move the group to a different enclosure. In the hope to avoid the stress of traditional wrangling techniques, students decided to train all members of the troop using positive reinforcement training to simultaneously enter individual crates in which they could be transported and anesthetized. Training challenges included newly established relationships between the capuchins and trainers, having only twenty days to complete the training, and more dominant animals interfering other animals. Trainers used small approximations that resulted in the crating of all capuchins in two minutes and twenty-three seconds the day of the workup. New training challenges were encountered following the work-up as the animals were released into a new enclosure. Our responses to these new challenges were to immediately begin desensitization, relationship rebuilding, and station training. This paper discusses the successes observed during this training and examines areas of improvement. Because animal and human behavior can be pushed beyond the borders of tradition, we believe these techniques could be applicable to other sensitive animals living in group housing. Our end training goal is to re-crate train all the capuchins for future medical and evacuation purposes; currently, two crates have been reintroduced. Creating engaging, interactive exhibits can be challenging, especially when the physical facilities are neither visually engaging nor conducive to interaction. At Roger Williams Park Zoo, the public relations department and the animal care staff collaborated to develop a program which showcases some of the amazing adaptations of our 1.1 white faced Saki monkeys Pithecia pithecia, to create a more appealing and effective exhibit experience with no physical changes to the enclosure. We did this in three steps. First, we expanded the behavior management program of the saki monkeys. Next, we created a keeper presentation utilizing this enhanced training and actively seeks out visitor participation. Finally, we combined the first two elements and shared the experiences with the public beyond zoo grounds via social media. ‘Super Saki Saturdays’ has led to improved animal welfare, a better exhibit experience and a significant increase in the level of engagement with and interest in the saki monkeys. The Houston Zoo is home to ten chimpanzees and six orangutans. Developing novel and stimulating enrichment for these intelligent primates is a constant challenge. The iPad was recently introduced and evaluated as a new enrichment activity over a six month time period. In an effort to keep the iPad novel and give each ape an equal opportunity for interaction, all individuals were given five minute sessions at least twice a month. A variety of applications were offered for the apes to interact with or observe on the iPad. These applications were divided into categories dependent on certain criteria including auditory stimulation, visual stimulation, interaction level, activity level, and problem solving components. Their interest level and interaction were recorded for the iPad itself as well as for specific applications. In this study, it was determined that juveniles had the most interest in the iPad as well as in the highest variety of applications. Adult females also showed a high level of interest in the iPad but often had specific applications that they favored based on individual preferences. Adult males had the lowest interest level. Differences between the species were minimal with both species showing a preference for brightly colored applications that also provided auditory stimulation. The information gathered from this evaluation is being used to further develop the iPad as an enrichment activity by providing insight into what types of applications would be the most enriching to introduce to these two species in the future. The Wildlife Department at Six Flags Discovery Kingdom houses a variety of mammals, reptiles and birds. Maasai, a seventeen year old African Serval, who had previously been worked in a free-contact setting, displayed some aggressive behavior and was soon deemed unsuitable for free-contact training. When a new team of trainers took over his care, they decided to reevaluate his current handling protocol. A training plan was implemented and, through the use of operant conditioning techniques, staff members were able to reestablish and strengthen their free-contact relationship with him. Not only does he once again participate in educational programs, but trainers have also established new husbandry behaviors which include a voluntary injection and blood draw behavior. (In addition, he is currently learning a voluntary blood pressure behavior.) These new behaviors now allow Maasai to participate in his own husbandry care, providing him with increased mental stimulation and more positive interactions with his trainers. The National Aquarium, Baltimore has a small collection of animals that are used for education programs, special events and enhancing the visitor experience. These animals are frequently in close contact with the general public, so they receive thorough, annual medical exams. The two parrots in this collection, a hyacinth macaw (Anodorhynchus hyacinthinus) and an umbrella cockatoo (Cacatua alba), have been trained a variety of medical and husbandry behaviors using positive reinforcement techniques. This allows the staff to perform routine care (e.g. wing /nail trims, administration of oral medications from a syringe, application of topical treatments) and several minor procedures (e.g. nasal swabs, physical examination by a veterinarian, cardiorespiratory auscultation). It is still necessary to sedate the animals each year for phlebotomy and radiographs, so the birds were trained inhalant anesthesia induction using voluntary control. The individual birds have very different temperaments and preferences, so distinct training plans were needed for each animal. Close collaboration between the veterinary staff and the animal trainers was also crucial during the training process. Having all of these behaviors in the parrots’ repertoires has made the annual exam process much safer and less stressful for the handlers, vets and animals. In particular, the voluntary inhalant anesthesia induction has been integral in allowing more invasive procedures to be performed with minimal stress on the animals. For many years a variety of animals have been used by institutions as ‘ambassadors’, helping further their educational messages. These animals can play a vital role in the mission of the institution by allowing up close and personal experiences to visitors and audiences alike. Historically, these collections have often been a mix of domestic and non-domestic species which are typically presented in a free-contact context most often held or carried by a person, be it staff or volunteer. These animals often have no choice in how they are handled or presented and yet are asked to be calm in various situations, even allowing close physical contact in many. So, are there ways to make these experiences more positive to an animal that is not typically part of a formal training program? By utilizing knowledge of each animals natural behaviors and it's natural history we can give these animals more control and choice over their environments thus making them not only better program animals, but making them true "ambassadors" for not only conservation, but for better animal management practices. Henry Vilas Zoo is a relatively small zoo with a small staff, so every keeper works in areas outside those of their primary responsibility at one time or another. This means that the big cat area currently consists of two adult tigers, two adult lions, and thirteen adult staff members. Because of the shared nature of our duties, the goal of this project is to get the entire staff participating in positive reinforcement training (PRT) for the big cats. As the Henry Vilas Zoo progresses with our PRT goals and strategies, we realize the need to desensitize the cats to multiple people and distractions, facilitate better sharing of information between staff, and transfer behaviors to a wider group of trainers. The involvement of keepers from other animal areas will help the entire staff work collectively and have a vested interest in moving the big cat area forward. This big cat behavioral husbandry plan allows all involved keepers to continue learning and practicing training techniques in a team setting, helps build trust between keepers and animals, as well as fosters an environment for sharing ideas. Knowing the strengths of the staff members in our facility, and utilizing them where they fit best with our individual lions and tigers is a key component in successfully reaching our PRT goals. We hope that this strategy will serve as a model for teamwork in other areas of the zoo, as well as in other facilities. 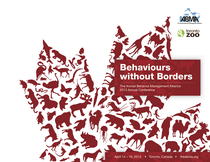 As North Americans, we have a particular view of animal welfare and human-animal relationships. We implement training and enrichment programs, provide health care, and have strict breeding programs. Would it be different if, as Buddhists, we believed in reincarnation and believed we should let the animals’ Karma decide what is good for them? ‘Care for the Wild International’ was worried about the welfare of the tigers and other animals housed at the Tiger Temple in Kanchanburi Thailand. This Buddhist temple is a very religious place and a popular tourist attraction where about 40 Bengal hybrid tigers cohabitate with the monks. The tigers are imprinted and are walked on leashes among various animals and temple visitors who are able to touch them. In 2008, ‘Care for the Wild International’ asked me to visit the temple and I have returned for every year for the past 3 years. I tried my best not to be judgmental about their procedures. I lived full time with monks in a Buddhist environment. Despite a language barrier, I learned about their radically different views. I learned from the monks, who believe that animals don't belong to humans but to the universe through reincarnation. Their faith and culture make their approach to animals extremely different. I saw an impressive imprinting program and also witnessed very concerning animal and human living conditions. While I couldn’t change the interactions with tourists, I had the Temple improve enclosures for many animals including the retired tigers. green module was not preset. Even though Virginia did not show a color preference, her tendency to choose the novel module indicates that she is able to differentiate two nearly identical color stimuli. In February 2012, WildCare acquired a hand-raised 1.0 Acorn Woodpecker for our Wildlife Ambassador Program. Acorn Woodpeckers spend a large percentage of their day collecting and caching food, mainly acorns. This caching behavior worked to our advantage during “recall” training. After coming to the glove and being reinforced, he would fly off to cache his treat. He was then set up to repeat the behaviour. In January 2013, a plan was developed to train him to participate in off-site programming. Since woodpeckers have fairly weak legs, an anklet similar to those used by raptors was not a restraint option. The alternative was a harness. The plan was to tether the woodpecker to a “caching” log and provide food. The educator could then present the bird performing natural behaviours in a safe setting. We simply had to train the woodpecker to a harness. Simple right? Not so much. The training required him to stay on the glove, but a large part of his reinforcement was the opportunity to cache his treat. Our dilemma was how to train the non-natural behaviour of accepting a harness which required the bird to remain on the glove when his reinforcement was largely the natural behaviour of caching food which necessitated leaving the glove. This paper presents the various challenges we faced throughout the training process and how we delved into the depths of our imaginations to come up with solutions. A voluntary urine collection behavior has been trained to two of the 4.0 Sumatran tigers (Panthera tigris sumatrae) at the Downtown Aquarium in Denver, Colorado. Prior to beginning any training of the behavior, data was collected to determine if the tigers exhibited any patterns of urination relating to time of day or location. Once some patterns were discovered, training began, utilizing behavior approximations and positive reinforcement. Tiger A was trained in four months to urinate on cue and allow a trainer to place a collection device (a Frisbee™ on a stick) under his tail to collect the sample. The behavior is continually worked and maintained to allow for the collection of a monthly sample without the need for sedation. A voluntary urine collection has also been trained for one of Tiger A’s littermates and is in the process of being trained for the other two tigers housed at the Downtown Aquarium. This paper focuses on the challenges encountered in training this behavior to all four tigers and how they were overcome. Clouded leopards are notoriously shy animals, occurring deep in the forests of South East Asia. There are only 277 of these cats managed in zoos worldwide and to the best of our knowledge; the San Diego Zoo Global is the only zoo in the world that has trained adult clouded leopards on leash in shows. This achievement did not happen without many challenges associated with their shy behavior, breeding cycles, and food drives or lack there-of. We currently have two females and one male. For 10 years they were housed in quiet off-exhibit pens. 3 years ago they were moved to another area of the zoo, when a new program was developed; BACKSTAGE PASS. Both females were placed on public exhibit for the first time. The male moved up one year later. We will discuss all the issues associated with these moves, the daily exposure to the public, their continued performance in shows and the new USDA protocol for hands-on sessions with these cats; two leashes must be used for public safety. After many trials and tribulations, all three cats are presently and consistently performing on the new stage. Some of the challenges working with these animals include zero food drives while in estrus, having an intact male housed nearby and being extremely timid to new environmental stimulus.